When you’re moving, it can be very easy to forget that you have to also either move or get rid of your food in addition to all of your other things. Food is heavy and bulky, and it often needs special care like refrigeration to stay edible. It’s very difficult to move food, even over short distances, so your best option is to get rid of absolutely everything that you possibly can before moving day. Once you know you’ll be moving, it’s important to start using up the food you have so that you don’t have to transport it. Go through items in your pantry and the back of your freezer and try to come up with creative solutions for how to use them. Limit your trips to the grocery store to force yourself to use up the food you have. 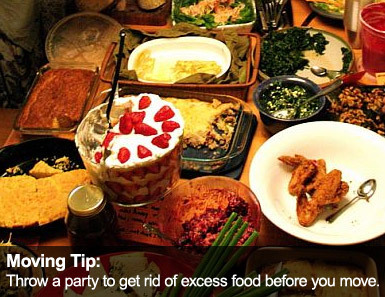 Consider hosting a party to get rid of any alcohol, drinks, and food. If you don’t have enough to completely feed your guests, consider having a potluck and using up what you can in the dishes you offer. Nonperishable goods like canned food and dried pastas, grains, and beans are all excellent candidates to donate to a food pantry. These can be some of the heaviest and bulky items to carry, so these are also the best items to get rid of through donation. Anything you absolutely cannot part with can be packed in a well-labeled box. However, when packing up your pantry, remember that most things are very easy to replace. Consider throwing away opened items, especially since they can easily spill during transit. You have two options with any refrigerated or frozen goods that you may have left over on moving day: keep or toss. Most food pantries are unable to take cold items due to their fragile nature. If you decide to keep cold items, be sure to have a cooler large enough to easily store them for transport. Keeping cold items is best left for short moves, preferably less than 6 hours away. You will have to keep these items with you to ensure that they are refrigerated as soon as possible when you arrive. It’s never fun to throw away perfectly good food, but you must be realistic when moving refrigerated or frozen items. Condiments are easily replaced, and very delicate foods can be nearly impossible to keep safe. When packing your cooler, remember to toss what you can realistically part with and only take the essentials.